1. I’ve never found a single example later than 1935. In fact the one pictured (5/12/35) is the latest one I’ve seen. 2. According to the United Feature Syndicate’s internal records, the strip ended on 1/31/1937. 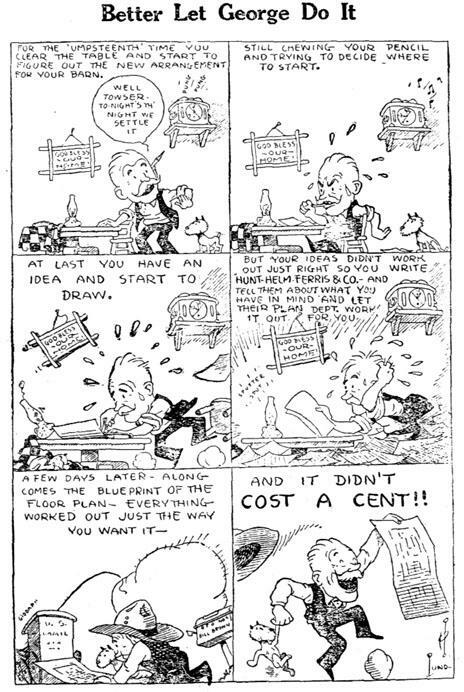 3, The Editor & Publisher annual syndicate feature listing for this strip ends in 1938, which means that the syndicate was apparently still offering it as of mid-1938. 4. I told a fib in #1. Actually I have one tearsheet of the strip that was printed in 1940. It runs in a comic section composed entirely of reprints of older strips. The syndicate that distributed this section (World Color Printing) was well known for buying up a complete run of a title from a syndicate and re-running it in their bargain priced comic sections. Item #4 makes me wonder if this strip might have been offered in reprints much earlier, and the reason I have no original run tearsheets later than 1935 is that the strip went into reprints around that time. 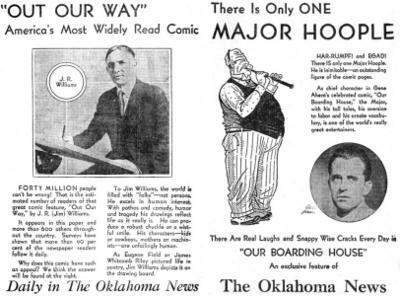 Naturally strips offered in reprints are seldom big sellers (if a newspaper editor liked the strip, they would have run it in its original run), so could this account for the lack of tearsheets later than 1935? My thesis is that the strip ended in 1935, then was offered in reprints until 1938 without much success. In fact the offer was not recorded in United Feature’s own records in 1938 as perhaps they had no clients at all buying it by then. By this time it was obvious to UFS that the strip was a dead issue for them, so they sold it outright to World Color Printing for use in their pre-print sections. Of course this is all just guesswork. 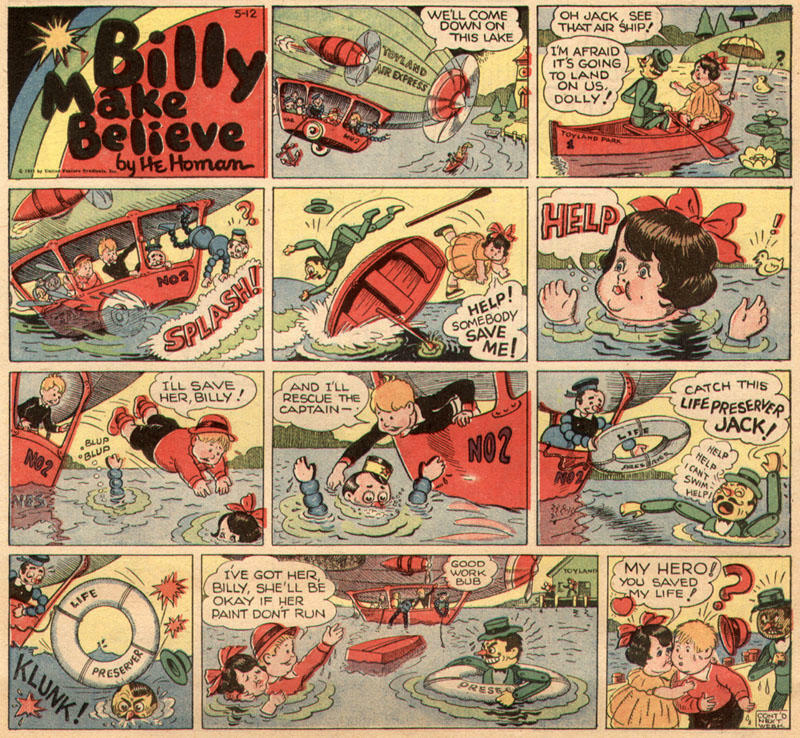 Does anyone have tearsheets of Billy Make-Believe from 1936 or later that would shed some light on this question? EDIT: A mere ten years after this post was published, Jeffrey Lindenblatt has found a run of the strip in the Harrisburg Evening News that most definitely puts the end date of the strip (there is a farewell panel and the strip is dated and copyright-slugged) at December 26 1937. Thanks Jeffrey! I have a box of drawings from Harry Homan and a few things from his son David. I have a lot of signed drawings from him. Proofs for "Billy Make Believe". I have drawings he did in 7th grade. House that was drawn by him and much more. We also have 2 of his comics that were in his box. Also have some panting by Harry. The art of cartooning may not be inherent in a person - one can learn it through the medium of a course at a local school or by correspondence. That many are interested in such a course is strongly attested by the results of the work of Mort M. Burger, director of the Associated Art Studios located atop the Flatiron Building of New York City. Mr. Burger is a well-known artist, having been on the art staff of several leading newspapers, in which his drawings still appear from time to time. A number of years ago he was associated with the late Dan McCarthy in the World Building. As director of the Associated Art Studios he has met with great success, conducting what is claimed to be one of the largest practical art schools in the country. 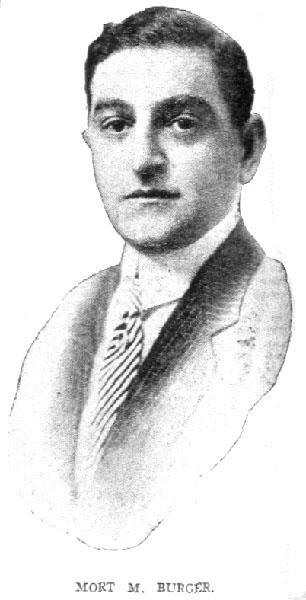 Mort was a producer of small panel cartoons which peppered the daily papers of New York and other cities in the 1900s and 1910s. These mini-cartoons fell out of favor in the mid-teens and Burger turned to other cartooning pursuits like this school. His activities were reported often in the pages of The Fourth Estate. A rare photo of Mort accompanies the article (see above). Walter Depew, formerly connected with the Capper Engraving Company of Topeka Kansas, and for several months staff photographer and artist of the Des Moines Tribune's editorial department, has been placed in charge of the art department of both the Register and Tribune. 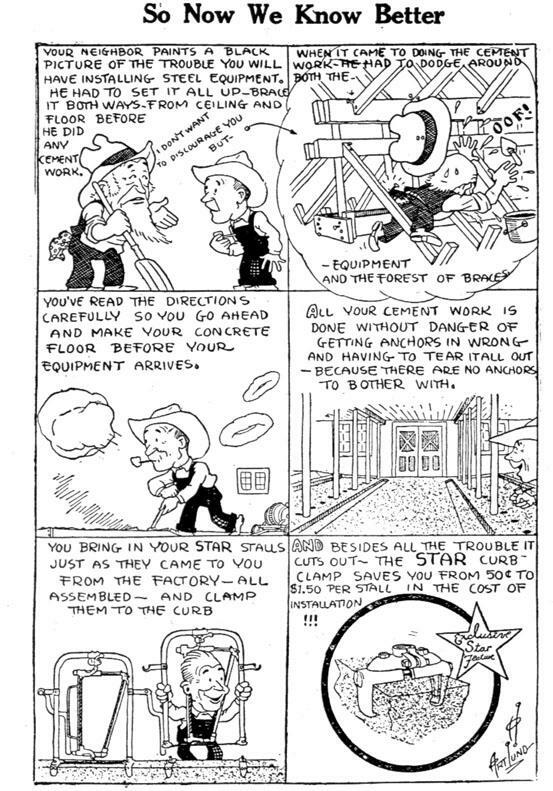 Depew later became the artist on the long-running Ned Brant comic strip. (9/16/1916) Leonard Lowson, formerly a cartoonist for the Winnipeg Manitoba Free Press, died last week in New York. 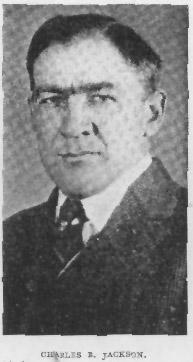 (9/30/1916) A. W. Oberlander, formerly a cartoonist for newspapers in Chicago and other western cities, died last week in Buffalo New York. Percival Pearce, a young cartoonist of Waukegan Illinois has joined the staff of the Publicity Feature Bureau. Pearce's claim to fame is his character Seaman Si. He did the strip while in the navy during WWI and a popular reprint book was published. Thomas A. Byrne, a cartoonist for the St. Louis Times, was recently attacked by a crowd of men in a St. Louis saloon, which, it is alleged, he had entered to secure evidence for a campaign against gambling and gambling houses being waged by the Times. It is said that a crap game was in full swing when Byrne's presence was noted by the proprietor and that the assault immediately followed the recognition. Gilbert Stuart, who is best remembered for his portrait of Washington, was also a cartoonist, and it was he, according to James Melvin Lee in Cartoons Magazine, who designed the famous Gerrymander cartoon. In 1811, writes, Mr. Lee, the struggle between the Democrats and the Federals for the control of Massachusetts was extremely bitter. The Democrats had elected Elbridge Gerry governor, and had carried both houses of the legislature. To retain this supremacy they remapped the senatorial districts and divided the power of their political adversaries by paying no attention to county boundaries. In Essex County the relation of the district to the town was most absurd, and a map of the county thus laid out, hung in the office of the Massachusetts Sentinel. One day as Stuart gazed at the map, he remarked that the towns as they had been assembled looked like some monstrous animal. A few touches of his pencil added the wings and the claws, and he christened the creature a salamander. At the suggestion of editor Russell the name was changed to Gerrymander. The cartoon thereafter frequently appeared in a 'broadside' while the term became one of reproach to the legislaturee that had distinguished itself by this act of political turpitude. Ad strips were once a common sight in newspapers. They fell out of favor starting in about the 1970s. Not sure why; it is a great marketing gimmick since most anybody reading your paper will pause to read a well-drawn comic strip. As always, click on an image to see it at a readable size. 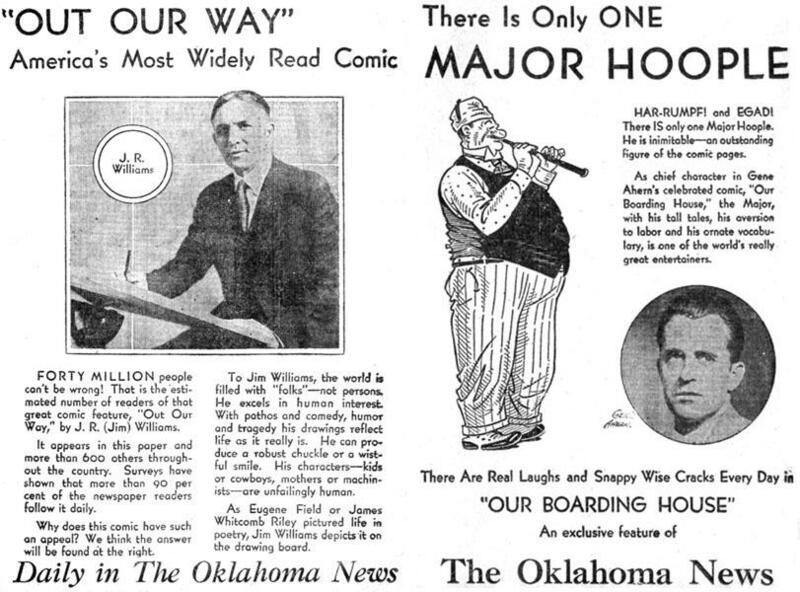 Here are Gene Ahern and J. R. Williams as they looked in 1931 from these syndicate-issued advertisements. Ahern was the creator of "Our Boarding House" (known to many by the name of its star, Major Hoople) and later "Room And Board" an essentially identical feature for a different syndicate. J.R. Williams created "Out Our Way", and is still well-known among a small but serious fan base for his "Bull Of The Woods" cartoons. These were gags about workers in a machine shop and are fondly remembered by those who worked in such environments. 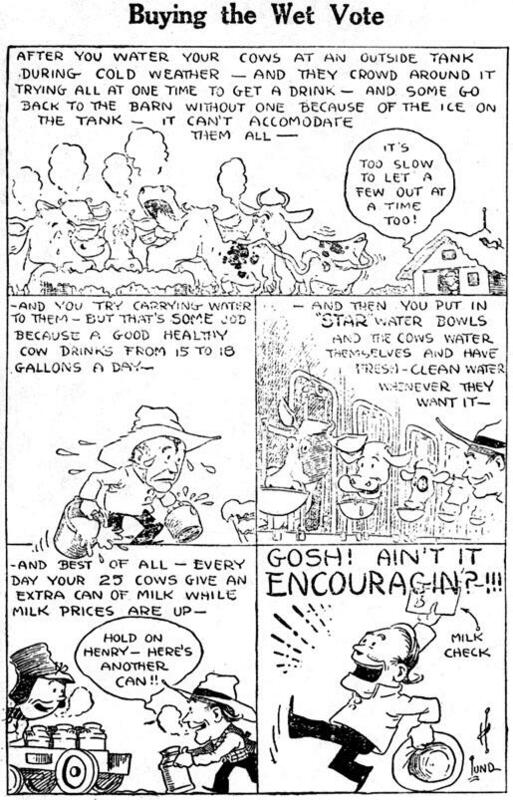 The "Bull of the Woods" cartoons were one of the many topics covered by the "Out Our Way" feature. I would note that today syndicates practically never produce and distribute such advertising materials as this for newspapers. Back in the 30s this sort of material was supplied constantly to papers. Just one more of the myriad reasons that comic strips are less popular than they once were. As always, click on the image to see it at full size. Uncommon now, newspapers that served the black community were available in most every city back in the pre-Civil Rights days. The Chicago Defender and Pittsburgh Courier were the most important and they both have a rich history of comic strips produced by the black community for the black community. Black papers in other cities often bought syndicate content from these two leading papers, but they also purchased from individual cartoonists and from the mainstream (white) syndicates. The examples above are interesting anomalies. They appeared in the Atlanta World in 1944, both titles having short runs. The World was a very unusual black paper in that it was published daily, not weekly as most of these papers were. The daily frequency gave them a voracious appetite for material without the budget to pay for much. They used a lot of cheap reprints from King Features (including the bizarre choice of "Tim Tyler's Luck", a strip whose setting was 'darkest Africa', where young white boys ran around barking orders at the natives). The World also occasionally bought material from small syndicates like the Elmo Feature Syndicate - I believe that the above examples, though uncredited, are from that bargain basement syndicate. A second layer of interest comes from the fact that both strips were done by Al Smith, who uses pseudonyms on both. Al was not only the successor to Bud Fisher on "Mutt & Jeff", but he also started his own syndicate (The Al Smith Service) in the early 1950s. I guess he needed a bit of extra cash so he did these quickies for H.T. Elmo. Perhaps his experience with this grade-Z syndicate was the catalyst for his creation of the Al Smith Service just a few years later on. Remember, you can see a larger view of each image by clicking on it. And sorry for the quality of reproduction - these images came from badly deteriorated microfilm. Sorry Ron Goulart and Maurice Horn, I have to disagree with you. 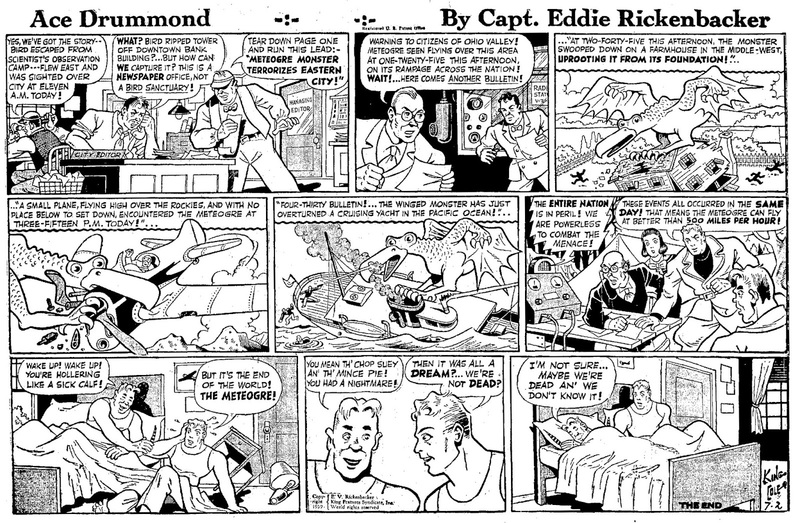 Both of these estimable gents claim that the "Ace Drummond" strip ended in 1940, but here is the episode of July 2, 1939 very clearly signaling the end of the run. Rarely do we get lucky enough that the creators are given the opportunity to write a definite end to a strip. In this case they take the quick and dirty way out - "It was only a dream!". Not the most original of endings but at least we know the end date for certain for a change. There's no wiggle room here, either - you can't see it on this image but on the footboard of the bed in the last panel it says "The End". * Oh, and by the way, the artist on the feature at the end of the run was none other than Royal King Cole - what a great name! Another by the way - can you imagine the fuss today if two guys were portrayed together in the same bed in a comic strip? Fetch the smelling salts Gertrude! * Note: image has since been upgraded to a much more legible one, courtesy of Art Lortie. Thanks Art! Great work! Good to see the history of comic strips being precisely defined! Were his adventures realistic, or did they include fantastic villains and/or civilizations like the serials of the time? Well, here's a good test to see whether my scans will show up large enough on the blog. The original scan is plenty large enough to read, but is it here...? This is a sample strip from a very short-lived series from 1928. Syndicated by McClure, it features good art by John Hix, who later went on to considerable success with his "Strange As It Seems" feature. "Strange As It Seems" was a blatant copy of Ripley's "Believe It Or Not", but Hix injected enough of his own personality to make it his own. Strips that adapt popular novels have been tried many times in the history of comic strips, seldom with any great measure of commercial success. EDIT: OK, turns out the image on this page is small, but if you click on the image it will show up full size in its own window. Glad we've got that straightened out. This year's "Roger Bean Book" by 'Chic' Jackson, cartoonist of the Indianapolis Star, is attracting widespread attention. There are 62 splendid illustrations, each one telling a story that will hold the readers' attention and interest. To those who are familiar with Jackson's daily strip, which deals with everyday life as it really is, this book will appeal in particular, as it is like having the best parts of an interesting continued story compiled and ready to read. Those who are not acquainted with Roger Bean will find it profitable to meet the square good natured 'regular guy' he is. His plump little wife, exquisitely feminine, the baby boy they adopted one Christmas eve, and Golduh Stubbins, the inexperienced maid of all work make up the rest of Roger's household. The title of the book is "Roger Bean On The Firing Line." 'Chic' Jackson hails from the state of Indiana, which has produced so many stellar lights in the literary field. His progress has been rapid, and today he is a household idol in Indiana. I came across your blog while googling "Roger Bean". Which I was doing because Chic Jackson is my great-grandfather. Nice to see that his work is still remembered out here on the Net! We've been a newspaper family for years, but Chic was the only one of us that showed his talent in art rather than writing. If you are interested in any biographical information, let me know and I'll put some stuff together for you. Great blog! I'm sure we'd all love to read some biographical material on Roger Bean's creator. I'd share it on the blog, natcherly. I have one question in particular about "Roger Bean". Many years ago I read somewhere that the character was originally an advertising shill for a brand of coffee called Roger Bean. Any truth to that? The comic strip came first, then the books, coffee, and other merchandise. Roger Bean was actually an attempt by the Indianapolis Star to draw attention to its classified advertisements, but Jackson proved such a good writer and creator of characters and situations that the strip took off among readers and was eventually syndicated. I am interested in exchanging information with Chic Jackson's relatives. I am seeking information about where he was born, where he grew up and where he was living in 1905. He painted a watercolor of my grandmother and gave it to her for a wedding present in 1905. I do not know how they knew each other and would like to see if I can find the connection.